Built in 1879, the Rome opera house also known as Il Teatro Costanzi or Costanzi Theater is located in the historical center, not far from the main train station Termini. The Teatro dell'Opera took its original name of Costanzi theatre from the contractor of the job, Domenico Costanzi. Costanzi appointed Milanese architect Achille Sfondrini, who specialized in the building and renovation of theatres, to realize the project. Sfondrini paid particular attention to the acoustics, designing the interior structure as a "resonance chamber", as is evident from the horseshoe shape. The opera house was built in eighteen months, and was inaugurated on November 27th, 1880 with a performance of Semiramide by Gioachino Rossini. Costanzi had invested virtually his entire fortune in the theatre and when the Rome City Council refused to compensate him, he was obliged to manage it himself. Despite the fact that he had to deal with various financial problems, he did an exquisite job of directing the opera house which held many world premiere operas, including Cavalleria Rusticana by Pietro Mascagni (17 May 1890), later to become a celebrated classic. The original theatre had a seating capacity of 2212, three tiers of box seating, an amphitheatre and two separate galleries, surmounted by a dome with splendid frescoes by Annibale Brugnoli. The theatre was also managed for a short time by Costanzi's son, Enrico, who deserves credit for having organized another great premiere, that of Tosca by Giacomo Puccini on January 14th, 1900. Not withstanding the excellent job the Costanzi's did of managing the theater, in 1907 it was purchased by the impresario Walter Mocchi on behalf of the Società Teatrale Internazionale e Nazionale (International and National Theater Society). In 1912, Mocchi's wife, Emma Carelli, became the managing director of the new undertaking and during the fourteen years of her tenure, she managed to stage numerous works that had not been performed before in Rome or even in Italy: La Fanciulla del West, Turandot and Il Trittico by Giacomo Puccini; Parsifal by Richard Wagner; Francesca da Rimini by Riccardo Zandonai; Boris Godunov by Modest Mussorgsky; Samson et Dalila by Camille Saint-Saens and many others. Last but not least, Diaghilev's Les Ba1lets Russes also performed there. 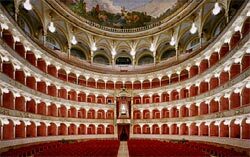 The Opera House kept its original name from the time it was constructed in 1879 up until 1926, when it was purchased by the city of Rome and the name was changed to the Teatro Reale dell'Opera or Royal Opera House. It was closed from November15th,1926 for restorations by architect Marcello Piacentini and it reopened on February 27th, 1928 with the opera Nerone by A. Boito, conducted by Gino Marinuzzi. The rebuilding resulted in a number of major changes; the entrance, originally located in the street formerly known as Via del Teatro where the garden of the Hotel Quirinale is presently situated, was moved to the opposite side, where Piazza Beniamino Gigli was subsequently built. The amphitheatre, inside the theatre, was demolished and replaced by a fourth tier of boxes (now the third tier) and the balcony. The interior was also embellished by new stuccowork, decorations and furnishings, as well as a magnificent chandelier composed of 27,000 crystal drops and measuring 6 meters in diameter. With the advent of the Republic, the name of the opera house was changed to Teatro dell'Opera, or Theater of the Opera and in 1958 the building was remodeled and by the City Council of Rome. The new plans were done by architect Marcello Piacentini radically altering the existing architectural style, facade, entrance and foyer. On 2 January 1958 the Theater scored another first with a performance of Norma starring Maria Callas. The most celebrated productions include Mozart's Le Nozze di Figaro in 1964 and Verdi's Don Carlos in 1965, conducted by Carlo Maria Giulini and directed by Luchino Visconti. Today, after almost a century, the Teatro dell'Opera still enjoys a growing prestige both at home in Rome, and abroad. Performances run from November or December to May and prices range from about €16 to €120 for regular performances; they can go much higher for an opening night or an appearance by an internationally acclaimed guest singer. In summer the Theater of the Opera stages performances in various outdoor venues, such as Piazza del Popolo.